Merry Christmas, an Interview with Phillies’ #1 Prospect, Jesse Biddle! Merry Christmas! My present is this, an interview with the Phillies’ NUMBER ONE rated prospect, Jesse Biddle. He’s a hometown boy and frankly, one of my favorites. He’s a great guy and I’m privileged to consider him a friend. This summer, I was lucky to get to know Jesse a little bit along with Adam Morgan (who also was nice enough to talk with me (you can read it here)). Both guys were gracious enough to take the time to fill out my little questionnaire, and for which I am very grateful. 1)Who was your baseball idol growing up? My idols growing up were a mixture of Steve Carlton, Cole Hamels, and (I know he’s not a Phillie) Andy Pettitte. I love the way all 3 of them approach the game and pitch with such confidence and intensity. 2)Do you have any special sports memorabilia? I think my favorite piece of sports memorabilia is my Willie Mays, Hank Aaron, Richie Allen baseball card that they are on together because they were 1, 2, and 3 in the home run race in 1966. 3)If you weren’t playing baseball, what would you want to do? I think I would definitely want to be a teacher just like my older brother, Sam is. Or else a Stunt Driver in hollywood. 4)What was your favorite moment of the 2012 season? I don’t know if I can pin point a favorite moment from the season but the most memorable one was when Colton Murray knocked down the Tampa Yankees shortstop and I experienced my first bench clearing. I don’t think I ever learned the proper etiquette at my Quaker school. 5)What are your plans for the off season? My plans for the offseason are pretty simple. Make up for 7 months away to my girlfriend, spend some quality time with my family and friends. And most importantly prepare myself for the 2013 season. 6)What are you most looking forward to next spring? I am most looking forward to the feeling of seeing the hitter stand in for the first time in spring training. That is an image that I get in my head as soon as I get home for the offseason and I get excited about all the way until I throw that first pitch. Again, I want to thank Jesse for taking the time to help out this little blogger. Spring Training is fast approaching and I for one, can’t wait! Ok, I have to say I tried blogging from the game but logistically, it just didn’t work out. I had some phone issues…. Ross and I have had some, shall we say, less than desirable experiences at Eagles games before (in Philadelphia) the worst of which was when I was punched by a Redskins fan! I had a few hesitations, but upon arriving, they were for nothing. Raymond James Stadium was sold out for the game, ironically it would have been only the 2nd televised game of the year so we could have watched it at home. You’d think with that volume of people, it would feel crowded and claustrophobic, but it didn’t. Our first stop was at a “Philadelphia Cheese Steak” stand for lunch. Ross had a standard steak and I had “a premium”. While Ross’ steak would have been good except we’ve had the REAL thing, and as we all know, there is NOTHING like a real Philly Cheese Steak! The premium was pretty good…it had thick slices of marinated steak, caramelized onions, sauce all on a chibatta bread. It was good, but not a real Philly Cheese Steak. The soda was actually good, not watered down like at many sports venues. There were a great deal of Philly fans and we had tickets to sit in the Philly fan section. Sadly, we lost our Eagles gear in the move. We had gone to several stores the week of the game, once we realized that we didn’t have our gear…but could not find any Eagles shirts or hats in the local mall. So we wore Bucs’ shirts. The stadium has very wide concourses and FREE refills for soda and popcorn if you get the souvenir size. (When have you EVER seen that?) The Pirate Ship was really cool. Captain Fear’s Ship, I love the football shaped lantern! I found that my fears had been unfounded. The fans were very vocal, as they always are, but it was a great time. We got to see the cannons on the ship fire. Ok, it meant that the Bucs scored, but it WAS cool…and loud. We were in the 10th row and the view was beyond AMAZING. I also caught beads that were thrown up into the stands. We were feet from the cheerleaders, too. The thing that I loved at that distance was that you could FEEL the game. You could see the power of the players, the light glinting off of their cleats and feel how fast it all happens. It was something you can’t get by watching the game on TV. It was such an amazing experience. We saw one Bucs’ touchdown literally feet in front of us, we were sitting right on the goal line. The Eagles game winning touchdown was just on the other side of the field from where we were sitting and since we were at the goal line, we could see how great a catch it was. So here we are Eagles football Sunday. We got these tickets back in August. We are excited, but…with the Eagles record, this could be a LOOOOONG day. Today started foggy, densely foggy and HUMID. It’s strange for a native Pennsylvanian to think of a foggy day as hot and humid rather than cold and damp, but let me assure you it is sticky. We are going to be sitting on the Eagles’ side, at the goal line opposite the pirate ship IN THE 10th ROW! (A benefit of following the Bucs on Facebook) Before you condemn me for that, just remember I live only 20 minutes from Raymond James Stadium, so the Bucs are my “new hometown team”. Tomorrow I will have a few special posts—LIVE FROM RAYMOND JAMES STADIUM as the Philadelphia Eagles take on the Tampa Bay Bucs. I will do my best to post pictures and updates. 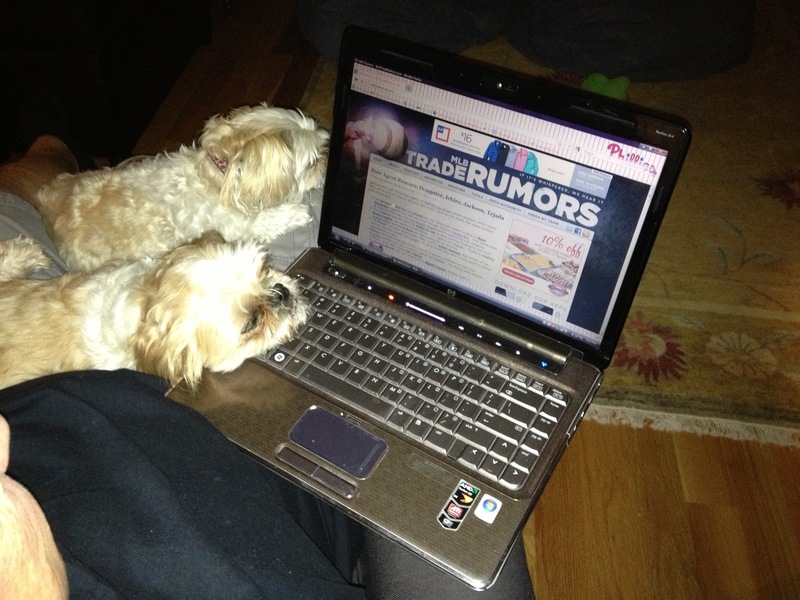 Even my Shih Tzu, Veronica has gotten bored reading MLBTrade rumors and waiting for Ruben Amarro Jr to make a big trade…..